Flake/Pearl Midcoat INTERCOAT CLEAR Metal/Auto Paint Qt by Custom Shop at Beaver County Collision. MPN: 4333060523. Hurry! Limited time offer. Offer valid only while supplies last. View More In Body Paint. It also works great as a carrier for spraying Automotive Metal Flakes and Dry Pearls. It allows the flakes and pearls to lay down smoothly and lock into place without drifting. 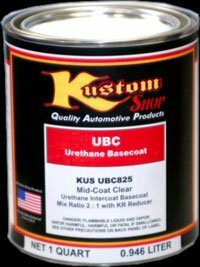 Great for mixing Kandies or sealing Kustom Paint & Artwork between Coats. If you have any questions about this product by Custom Shop, contact us by completing and submitting the form below. If you are looking for a specif part number, please include it with your message.